This might interest folks who want to expand their ability to work with young children. My brother works for a school (back home in the USA) where they try to give the kids as many creative possibilities as they can. 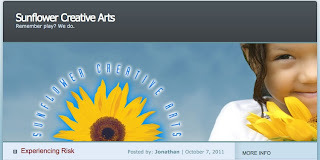 He hosts a blog called, Sunflower Creative Arts, where you can see some of the things they have accomplished. Certainly I enjoy reading it and catching up on how other people do their teaching job. So why not check it out?